Ladies and gentlemen, boys and girls: come one, come all, to the wonderful world of iPad cases! The flood of new-product announcements spurred by the introduction of the iPad 2 doesn’t seem to be letting up any time soon, but don’t worry—your faithful Macworld staff is rounding up the latest arrivals for your reading pleasure. It’s all in this special weekday version of our iPad case roundups. 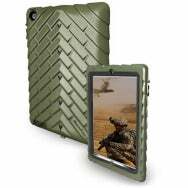 Gumdrop Cases: The name of Gumdrop’s Drop Series (iPad 2; $70) is obviously a dare, considering this case’s multi-layered construction, which looks like it could survive World War II, a hurricane, and the Rapture all at once. The case even includes a microfilm dust filter. Appropriately enough, the Drop Series comes in army green. Haven: If you happen to have a cool $475 CDN sitting around, check out the impressive CircDiscover, a "hands-free" case/bag designed for the original iPad. The CircDiscover includes super-strong construction, straps, and the capability to shift between orientations thanks to its customizable webbing. 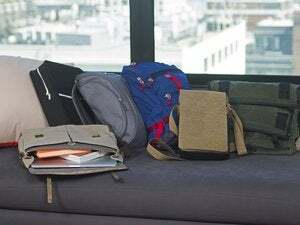 Incase: The Magazine Jacket (iPad 2; $50) provides end-to-end protection for your favourite device and doubles as a viewing stand or typing platform. 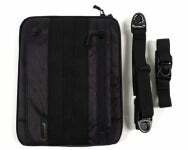 It comes in black and features all the appropriate cutouts for the iPad 2’s various openings and buttons. Steinhell: Protection for your iPad 2’s screen comes in the form of three different film products from Steinhell's Ultra Series ($22 and up). Each feature a made-in-Japan base film that promises bubble-free application and easy removal without interfering with the operation of the screen or Apple's Smart Cover. The Ultra Fine model features a slight texture for anti-glare functionality, while its Ultra Optics cousin includes a microlens array for the best screen resolution. The Ultra Crystal model is reinforced for maximum light transmittance and surface hardness. Substrata: This manufacturer has announced three iPad 2-compatible cases, each made of natural materials such as wood or leather. Let’s start with the TableTop Case ($85 and up), made of birch or walnut with a leather closure; it doubles as a multiple-angle viewing stand and closes to protect your device from dust and damage. The Open Case features solid-wood construction throughout while providing access to all of the iPad 2’s ports and buttons. Finally, the Artisan expands on the Open Case concept to include a closure. It's available in in solid walnut ($195), or striped walnut, cherry, or maple ($225 to $265). Trexta: This Turkish manufacturer brings five new designs specifically for the iPad 2, starting with the Fabcase, a simple sleeve made high-quality textured fabric, available in black or brown. The Tryangle combines a sleeve design with a viewing stand that supports multiple angles and also doubles as a typing platform. You can choose from black fabric or genuine black leather. For a splash of color, Trexta offers the Rotating Folio, which works as a viewing stand with multiple angles and features swivel webbing that allows you to orient the iPad 2 in either landscape or portrait orientation. The Rotating Folio comes in fuchsia, black, or camel brown. Speaking of color, the Mickey is a handy fabric sleeve that includes a shoulder strap and is perfect for outdoor use. It comes in black with yellow stripes, blue with azure stripes, or brown with pink stripes. The same color combinations are available for the Puhu, a similar covering with a soft, protective lining. The Mickey and Puhu sleeves fit both the iPad and the iPad 2.